Music at Annisquam Village Church: Lyricora returns to the Annisquam Village Church! Lyricora presents its Spring 2018 concert series, Let My Love Be Heard, on Friday, May 4, 7:30 pm in Newburyport, MA; Saturday, May 5, 4:00 pm in Chatham, MA; and Sunday, May 6, 4:00 pm in Gloucester, MA. For additional venue details and to purchase tickets, visit Lyricora's website at www.lyricora.org. 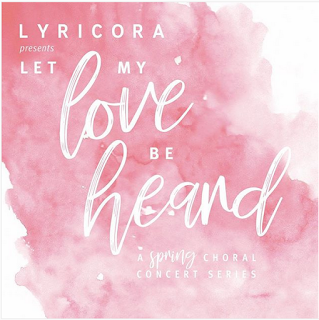 Lyricora explores the many facets of love across the ages, from the lively madrigals of the Renaissance to the lush and ethereal harmonies of the 21stCentury. This concert will feature selections by Lauridsen, Paulus, Runestad, Morley, and others. We hope you’ll join us to help celebrate the season of love! Lyricora is a Boston area ensemble dedicated to engaging, educating and entertaining audiences through performances of the highest caliber. The ensemble strives to integrate New England’s rich historical tradition of choral music with new directions in contemporary literature. In concert, Lyricora is dedicated to bridging the gap between listener and performer – presenting programs that are accessible to today’s audiences while maintaining artistic expression and performance.